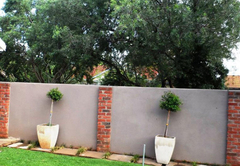 De Dane Guest Room is a property providing self catering in Bloemfontein for up to 2 guests visiting the Motheo Region. 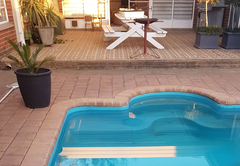 Situated in Bloemfontein, De Dane Guest Room is found in a quiet and safe area within walking distance of Rose Park Hospital, a supermarket and a high school. 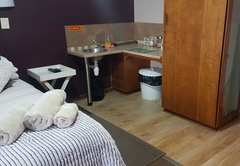 The location gives easy access to the N1 and Bloemfontein Airport as well as to the Waterfront Mall, the flower shower and the CBD. 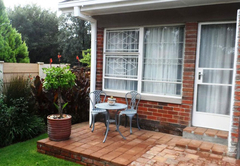 This is a comfortable and spacious one bedroom self catering unit which is furnished with a Queen size bed and has en-suite bathroom with a shower. The room can accommodate up to two persons sharing and an extra mattress can be provided for a small child. 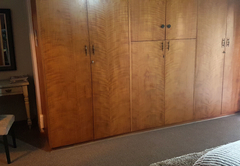 The guest room is clean, neat and modern; ideal for a short and long term stay. 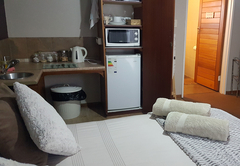 Facilities include a TV with selected DStv channels, a microwave oven, a small refrigerator and tea and coffee making facilities with rusks. 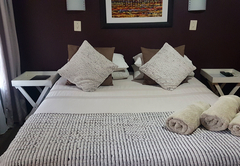 Bedding and towels are provided and the bedroom is equipped with air-conditioning. The guest room is separate from the house with a private entrance. 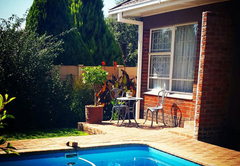 Guests can make use of the splash pool and secure parking is available. 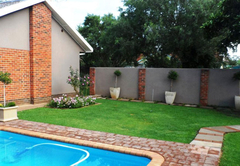 Bloemfontein offers a variety of attractions and activities. The Rose Gardens in King's Park, the Orchid House and the Naval Hill Nature Reserve are all well known and popular. 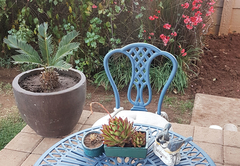 Guests can also visit the Free National Botanical Gardens, the Bloemfontein Zoo and Voortrekker Women's Monument. Child policyChildren under the age of 6 are welcome.